Hunt Tests are used to evaluate dogs and handlers against a standard, which the national organization establishes. If the dog and handler passes the test, the dog earns points towards various titles. In HRC we focus on traits used to hunt so our tests incorporate as much hunting realism as possible. This includes the handler using and shooting over the dog at marks at all levels. We use ducks at all events except upland, where chukar or other upland birds are used, and mark distances are all within gun range or a range that you would see while hunting. There are no marks / blinds over 175 yards and most often they are much closer. The rules specific rules of the of the Hunts are developed by the HRC and vary depending upon skill level Started, Seasoned, Finished and The Grand and can be found here Hunt Test Rules. 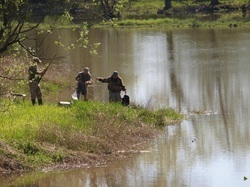 Usually, the club conducts two Hunts a year in the spring and summer allowing HRC members four opportunities a year to earn points toward the current and next HRC title. The Upland test is usually offered two times a year. The club follows the rules and guidelines established by the UKC for Started, Seasoned, Finished, and Upland. Hunt Test are a full weekend event with a tailgate dinner on Saturdays and awards handed out both days. You will be able to register for the events online via Hunt Secretary until May 25th. You can also register the day of the hunt at the administration table on a space available basis. We usually conduct tests on Saturday for Started, Seasoned, Finished, and Upland. We usually conduct tests on Sunday for Started, Seasoned, and Finished. The weekend is festive with a tailgate dinner on Saturday night. Lunch is available for purchase both days. You will be able register online at HuntSecretary.com. ​On a space available basis, you may enter at the administration tent the day of the event. For a list of current club events visit the Calendar Page. NEW Hunt Test Location: Jerry's Place, 17126 State Route 203 (also known as Monroe-Duvall Road), Monroe 98272. Entrance to the property is on the west side of the road.